Can you find your way out of every of the 100 room? Use in-game clues, solve addictive puzzles and open the door of each of the 100 rooms. This game is improved upon the concept of 100 Doors Escape. - Unlock the door to escape and get to the next door. - You can pick certain items up and use them from your inventory. 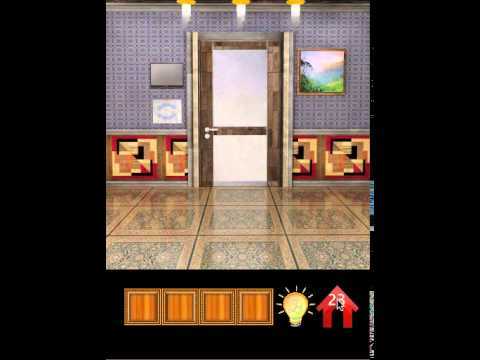 - 50 more released as: "100 Doors Brain Teasers 2"
It is a level based game and the levels can be categorized into four door types. In the first type user has to look for clues and find a numeric based, a color sequence based or a text based code to open a door. In the second type user needs to look for objects, combine them and find a key. In the third type user needs to move four images into one of the two boxes in the room. In the last type of rooms user has two sets of four images and the player has to match one image from first set to a corresponding image in the second set. The room provides clues to achieve the task.